Hem Switchar & Splitters Matrisväxlar 4x4 HDMI till HDBaseT Lite KIT Matris med 4 mott. 4x4 HDMI till HDBaseT Lite KIT Matris med 4 mott. CYP/// PU-44XL-KIT är det perfekta insteget i HDBaseT-världen. En fullfjädrad Matrixväxel med 4 HDMI in och 4 HDBaseT Lite ut. Fjärrkontroll, IR knappar på fronten, IP eller valfritt styrsystem via IP eller RS232 är vad du kan styra den med. 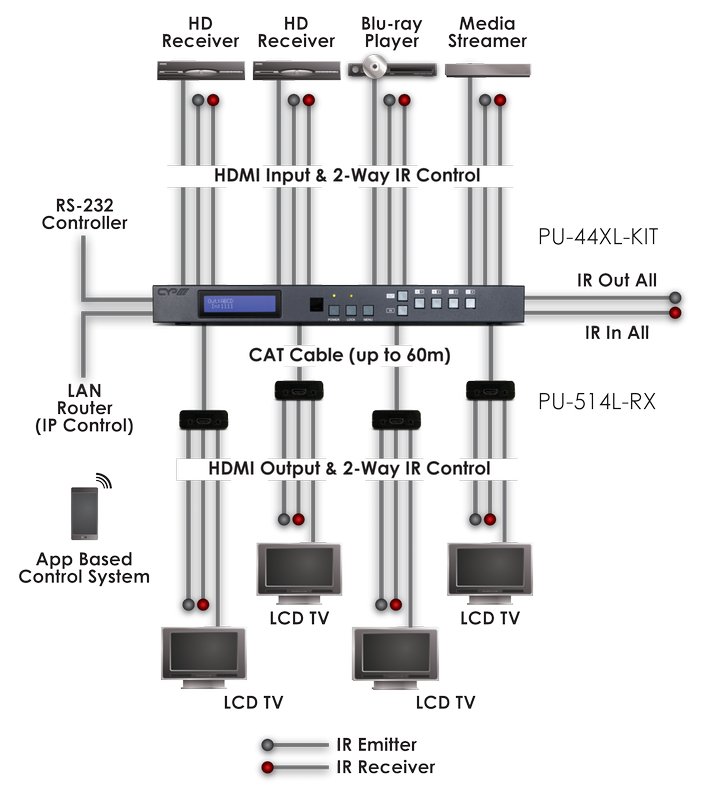 This 4 by 4 HDMI HDBaseT™ Matrix supports the transmission of video (resolutions up to 1080p Full HD and [email protected]), multi-channel digital audio and control via IR, RS-232 or Web GUI/Telnet IP from four high definition sources to four HDBaseT outputs over a single CAT5e/6/7 cable (up to 100m) for each output. The PU-44XL-KIT is supplied with 4x PU-514L-RX receivers which utilise the 2-way IR control capabilities of the matrix. Use the LAN serving capabilities of the matrix to add internet connectivity to every zone. In addition, this matrix also features IP control allowing users to access and control the matrix remotely and also allow additional options for integration of third-party control systems. CYP provide control drivers for control systems such as Control 4, Crestron, AMX, Control FX, and RTI. These are available at no extra cost. Common supported resolutions : HDTV: 480p, 576p, 720p, 1080i, 1080p, 1080p24: PC: VGA, SVGA, XGA, WXGA, SXGA, UXGA, WUXGA. Supports HDMI input up to 15m 1080p 8bit or 10m 1080p 12bit.